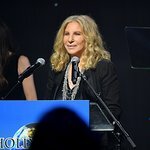 Barbra Streisand has written an Op-Ed in USA Today on heart health equity for women. “Some sobering numbers are worth considering: Cardiovascular disease claims the lives of nearly 400,000 women each year. One in 3 women die of heart disease and stroke, whereas one in 32 women die of breast cancer. Sadly, but a point that should give us great hope, about 80% of heart disease and stroke in women is preventable or manageable.